Nayanthara is currently working in Thalapathy 63 directed by Atlee. She recently starred in K.M.Sarjun’s horror thriller Airaa which was released on March 28 and is currently running in theatres. Recently, the trailer of her film with Chakri Toleti was released a few days back. Titled Kolaiyuthir Kaalam, it is produced by V.Mathiyalagan under the banner Etcetera Entertainment and has music composed by Teemu Takatalo. The production house has now given a press release with respect to release and censor certification. In this, they have stated that the movie will have a release during the second or third week of May but the date can only be fixed only after the film is censored and certified. With Nayanthara doing back to back films, her Mr.Local by M.Rajesh with Sivakarthikeyan is also planned as a summer release which is all set release in theatres worldwide on May 1. Thus, for Nayanthara fans, this summer will be a treat. 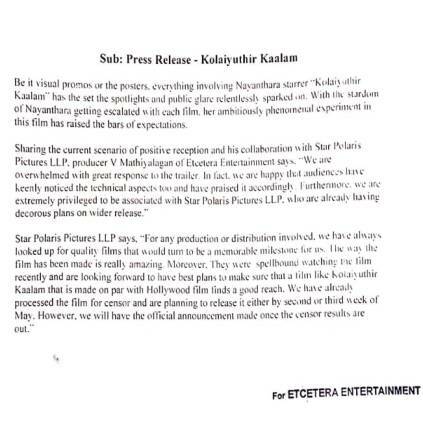 People looking for online information on Chakri Toleti, Etcetera Entertainment, Kolaiyuthir Kaalam, Nayanthara, Release date, Sarjun KM will find this news story useful.